Gov. Ron DeSantis has chosen a female Cuban-American appellate judge as his first pick for the Florida Supreme Court. MIAMI (AP) — Gov. 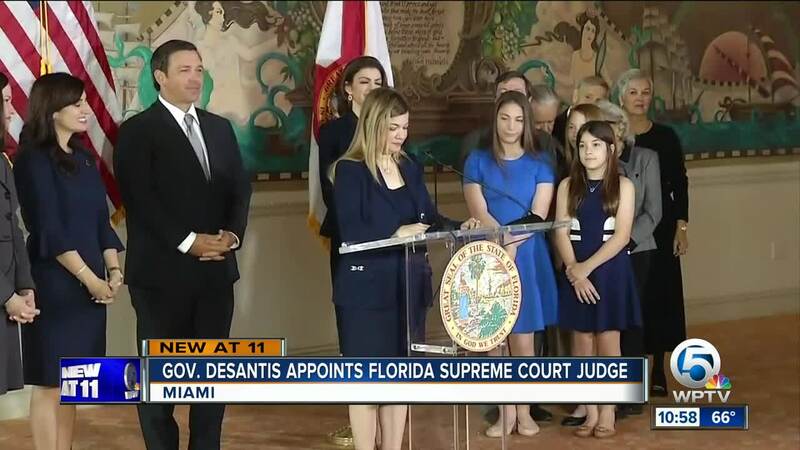 Ron DeSantis has chosen a female Cuban-American appellate judge as his first pick for the Florida Supreme Court. The new governor on Wednesday announced that Barbara Lagoa will fill one of three open seats on the court. Lagoa, a daughter of Cuban exiles raised in Hialeah, has been a judge on the 3rd District Court of Appeal in Miami for the past 12 years. DeSantis said 50-year-old Lagoa has an impeccable judicial background and that her Cuban-American upbringing gives her extra appreciation for the rule of law. The announcement was held at Miami's Freedom Tower. Lagoa attended Florida International University and Columbia University law school. Her father-in-law is Miami senior U.S. District Judge Paul C. Huck. DeSantis has two other Supreme Court picks due to mandatory retirements.